Yes, you read that correctly. The iPxxx devices don’t natively support DLNA functionality, which rules out using Windows 7 Play To”, so I decided to see what could be done, at least as a proof of concept, to try to get this working. 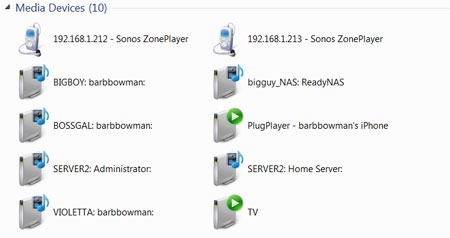 The secret sauce was finding an app called PlugPlayer and installing it on my iPhone and iPad and seeing my iPxx devices show up in the Network Window . 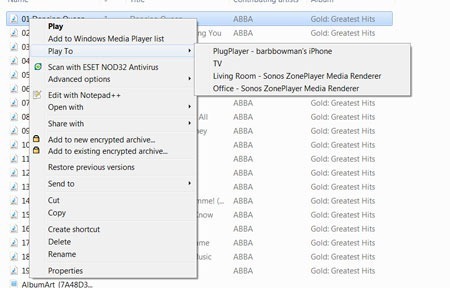 I was intrigued, and not expecting much success, used Windows Explorer, right clicked a music file and saw not only my TV and Sonos Players listed, but my iPhone (via PlugPlayer) as well. Then, the next task was finding which file formats would be supported.